Sending an author around on a book tour is an expensive proposition for any publisher. I don’t know how they can justify the cost of air flights to and from dozens of cities, plus all the restaurant meals, hotels, and author escorts. Sometimes you fly into a city and you just sell ten books. How does that pay? My publisher, Andrews McMeel, is incredibly supportive, but I had a feeling they could never afford to send me on a 30-city jet-set extravaganza for this book launch. I can’t blame them. Rather than sit home and whine, I had a crazy idea. My wife Jeanette and I are empty-nesters now, with our youngest off to college. 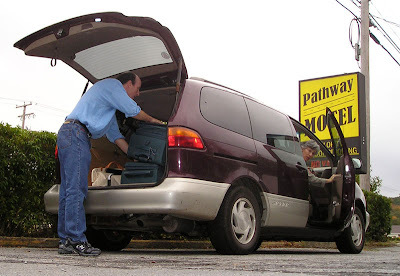 Why not head out in our old family van, “Trusty Rusty?” We’ve been hungry to hit the road anyway. We could visit the little bookstores that are too far from airports to lure the jet-touring authors. We could do a few lecture gigs to pay for gas and meals. I’ve been curious to learn what art students are thinking about these days, so I lined up speaking engagements at nine different art schools. The publisher met us halfway. They agreed to pay for the hotels as long we took care of everything else. Yesterday we dropped off our parakeet to the pet shop and returned all our library books. This morning we’re starting south on the first leg of the tour. Here’s a picture taken just minutes ago. Trusty Rusty is riding a little low on her shocks. She’s loaded down with boxes of books, a big drawing easel, sketching gear, a digital projector, a laptop computer, fountain pens, Verdi CDs, and granola bars. We’re on our way into New York City, for a day of museums and galleries. For you art-tech-fanatics, I’ll post some practical art tips from time to time, but I’ll be less the professor and more the hobo for a few weeks. I'm sure the environment thanks you. I teach art at a boys private school and I'm trying to leave them with an open minded impression of art. In one class I used some of you art work to teach, I got the kids to imagine what the dinosaur looks like based on the bones. I showed them how you work by showing them images from your blog.It was a lot of fun. I've thrown everything Greenberg said about kitsch out the window. While you are in Towson, MD I highly recommend getting some pizza at Pasta Mista. One of the high points of my senior year of college was when they opened and I became an almost daily regular. haha love the nick name for the van. We call our old 88 van, "the dieing rhinoceros" for obvious reasons. We recently got a new pony of a car.